Home › Sociology › gender & feminism › First Birthday Down Under Feminists Carnival! 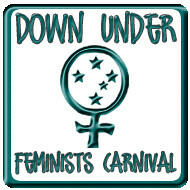 First Birthday Down Under Feminists Carnival! The twelfth and Bumper Birthday Edition of the Down Under Feminists Carnival is up at Chally’s place, Zero At The Bone. Many thanks to Chally who I know has put plenty of work into it. And yes, there is cake. If you’re a regular reader, or especially if you’re featured in the carnival, please place a link to it. You’re welcome to use the logo at top and to hotlink to it; please also make the logo link to the main Carnival page. The thirteenth edition of the carnival, for May posts, is planned for the first week of June, 2009. It will be hosted by Demelza at SAHM Feminist. Submissions to demelzagf at yahoo dot com for those who can’t access blogcarnival. I am pleased to report that we’ve made it to a whole year of wonderful carnivals without anyone once skipping, being late, or dropping the ball. You’re all awesome. Who’d like to volunteer for a future carnival? Thanks for the link and you’re welcome for the work. I would definitely recommend volunteering, everyone. *is exhausted and elated* See, Lauredhel? I told you the cake was no lie!! Yes!!! I love this regular celebration of our antipodean feminism.